I get a little nervous when people mix fact with fantasy. Often truth gets lost in the process. But I got a little choked up recently when I found this Christmas ornament in Hobby Lobby. Santa is bowing to Baby Jesus. In case you haven’t figured it out yet, Santa is not real. For all the people who wear “I believe” pins at Christmas, no matter how hard you believe in Santa, no one really lives at the North Pole, rides a sleigh pulled by flying reindeer, or drops toys at the homes of every good boy and girl in the world. The fantasy Santa may be based on a few facts about an historical figure, but all the current stories about Santa are wishful thinking. Jesus, on the other hand, is named Truth. No matter how many people don’t believe in him, no matter how much false doctrine or how many sweet stories distort the truth, the Bible’s account of his life is true. It was personally witnessed, well researched, and meticulously documented. God inspired men to record his story without error. Modern Christmas stories may add to the truth, but we can trust the Biblical account to the smallest detail. So why should I get choked up by a fantasy Santa bowing to a factual Christ child? Santa symbolizes many things. As a child I was afraid of the department store Santas. They seemed to be big bullies stealing the limelight from Jesus whose birth meant far more than kids getting new toys. As I matured I mellowed a bit. The Santa story became a fun story like Cinderella or Mary Poppins. The basic story of Santa is all about getting presents, basically greed. Often writers put a more noble spin on the Santa story by creating a fictional character who helps Santa get the presents to children, thus shifting the focus from receiving to giving. This character “saves Christmas” by helping Santa get toys to children. So Santa symbolizes toys, receiving and sometimes giving presents, and setting your worries aside for a few days of celebration. Often Santa stories are about hoping for something good to happen against all odds, based on the premise that if you wish for something strongly enough, and believe it will happen, your wish will come true. The true story of Jesus means anyone can receive salvation. This isn’t a mere Christmas wish. This is a promise based on historical facts: The Son of God didn’t grasp onto the outer trappings of the glory he received in heaven as God. He voluntarily set aside some of his glory as he added humanity to deity and became the unique God-Man. He offered himself and his truth in a form that people could accept or reject. He died for our sins to satisfy God’s demands for righteousness. He rose again to show God’s approval and display his victory over death. Those who are sorry for their sins and receive God’s true gift of salvation cancel their sin debt and become God’s own dearly loved children. 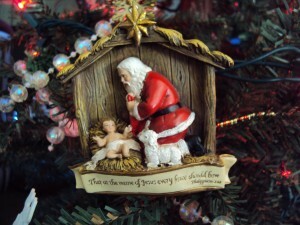 Santa’s sweet story of kids getting Christmas toys can’t compare with Jesus’ forever gift of salvation. But let’s set that tremendous truth aside for a moment and look at what the two stories symbolize. Santa: toys, fun, wishes, a happy feeling once a year. Jesus: salvation, forgiveness, new life, assured hope of God’s strength for today and an incredible future. Santa is about wishful thinking, blind faith that something good will happen simply because you want it so much. Jesus is about a sure faith in a powerful, loving God for salvation and promised help in the time of need. Today I find much fear and despair, even among Christians. You know the classic story of the scrawny kid who is continually bullied? Eventually this kid rallies courage to smack the bully good and hard, one time, until the bully finally leaves him alone. To fearful Christians God is like this fearful kid who will one day beat Satan just soundly enough that Satan will quit picking on him. Wrong story. God is more like the weight lifter who agrees to an arm wrestle challenge by a scrawny kid. The weight lifter allows the kid to grunt and push, but the strong man’s eventual victory is sure. So I stand in Hobby Lobby, surrounded by dazzling Christmas decorations, staring at a Santa, hat in hand, bowing to Baby Jesus in a manger. Underneath the two rivals (Santa and Jesus) are these words: “That at the name of Jesus every knee should bow. Philippians 2:10.” The owners of Hobby Lobby get it. They sell fun items for a festive season but the Christian music playing in their store and the many Bible references in the store show their heart. Decoration, fun, and frivolity bring joy to the season, but all of the trappings of Christmas need to be subservient to the one central truth of God becoming man to die for our sins. The ornament also reminds me that the often confusing days of the present won’t change the sure future when “at the name of Jesus every knee should bow, of those in heaven, and of those on earth, and of those under the earth, and that every tongue should confess that Jesus Christ is Lord.” (NKJV) One day God’s children will bow before him, and his enemies will bow with them. All the false religions, gods, ideologies, and fantasies (including Santa) will bow to his truth. Satan himself will be forced to bow his willful knee. Jesus came to earth as a servant and a Savior two thousand years ago, but someday I will see him in his majesty. Everyone will bow before him and recognize his name which is above all others. This Christmas if you are feeling defeated, beaten, weary, and worried about the future, it’s a good idea to set your worries aside for a few days and take pleasure in the simple joys of the season. But for true hope turn to Philippians 2:5-11 and meditate on the same truths Paul thought about during a prison stay when he face opposition even from other believers. Jesus stepped down from heaven’s glories to become a servant, then our Savior. This is just the beginning of the story. In the end all of God’s children get to join in the victory celebration, the worship service, when all will bow the knee to him. Defeat and worry will only be a distant memory. Every day will be more than Christmas. It will be Christ—with him, through him, and for him for all eternity. May this certain truth brighten your Christmas season today!